Gastro Intestinal Junior For puppies less than 12 months of age with acute and chronic diarrhoea, maldigestion, malabsorption, Small Intestinal Bacterial Overgrowth (SIBO), re-feeding after surgery, colitis, gastritis, Inflammatory Bowel Disease (IBD), Exocrine Pancreatic Insufficiency (EPI), inappetance. Combination of highly digestible proteins (L.I.P. * proteins), prebiotics, sugar beet pulp, rice and fish oil to ensure maximum digestive security. A high energy density fulfils puppies' growth energy requirements while helping reduce the amount of food given per meal, decreasing the digestive workload. Puppies with digestive disorders can be weak and their appetite reduced. Junior kibbles are adapted in size, texture and shape and are easily rehydrated, encouraging food intake. 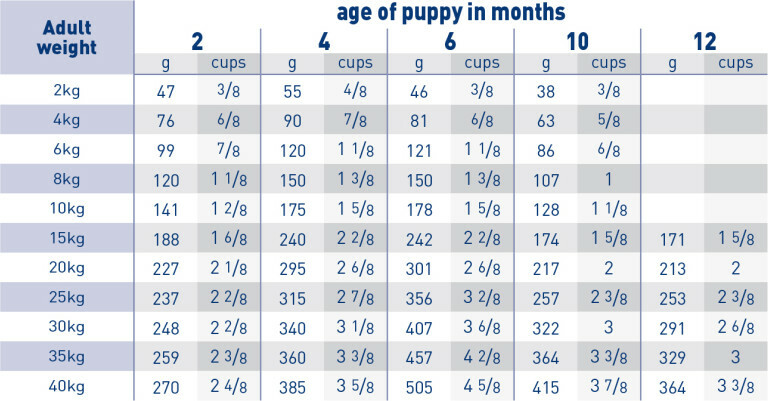 Formulated to take into account the nutritional needs of growing puppies. Rice, dehydrated poultry protein, animal fats, maize, dehydrated pork protein, wheat gluten*, hydrolysed animal proteins, beet pulp, minerals, egg powder, soya oil, fish oil, yeasts, psyllium husks and seeds, Fructo-Oligo-Saccharides (FOS), hydrolysed yeast (source of Mannan-Oligo-Saccharides), marigold extract (source of lutein). Crude ash: 8.2%. Crude fibre: 1.2%. Crude oil fats: 22%. Moisture: 8%. Protein: 29%. Vitamin A: 11400IU, Vitamin D3: 1000IU, E1 (Iron): 43mg, E2 (Iodine): 3.3mg, E4 (Copper): 10mg, E5 (Manganese): 56mg, E6 (Zinc): 183mg, E8 (Selenium): 0.08mg. Preservatives - Antioxidants.